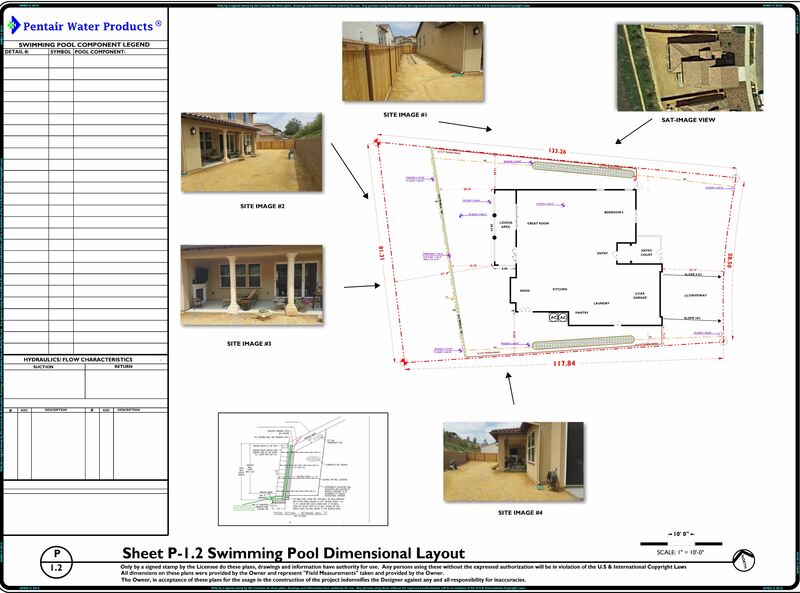 We are requesting confirmation of the dimensional layout for swimming pool so, that the advancement of the planning layers can progress. The 3-D photo images do not reflect total accuracy for the home’s foundational layout, therefore we have made adjustments. Please review the P-1.2 REV-1 sheet and provide us with your comments. Q1. )The wall is only 5’6″ – maybe 6’8″ with foundation? Do we have to have a 5′ setback? A1.) 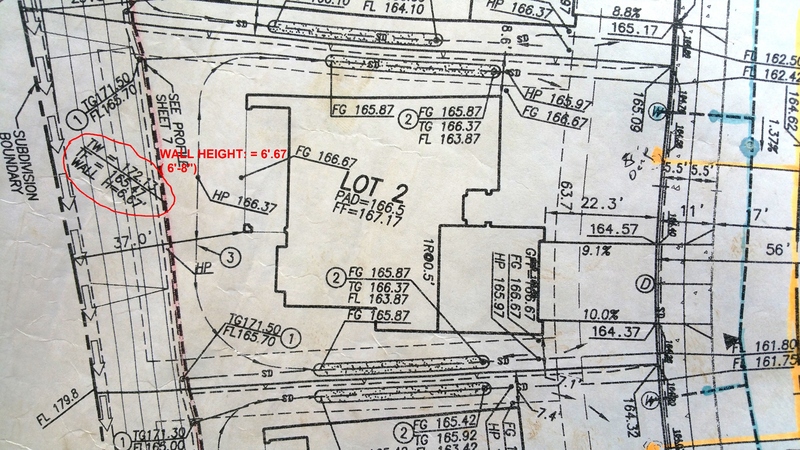 The survey below of the property indicates a wall height of 6.67′ (6′-8″). Q2.) Have you conversed with engineer yet? A2.) The slope’s set-back is actually 7′-6″ w/o inuring and additional surcharge. 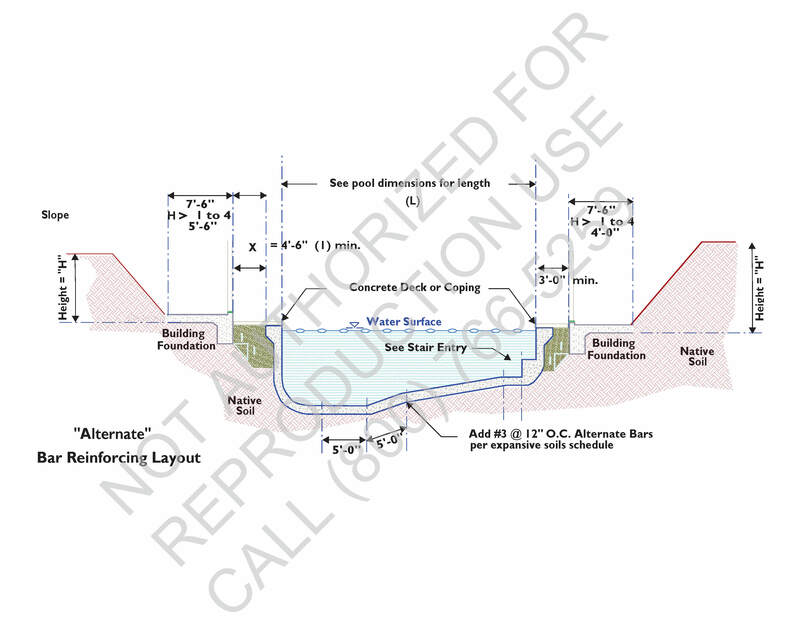 Thus 5′-0″ will require the pool wall to have special surcharge “Detail”. The pool can get closer but, as it gets closer to the wall’s footing,…the pool’s shotcrete thickness increases and the steel reinforcement size and density will increase. These will have increase costs to the construction. Q3.) What is the swim-out bench? A3.) The swim-out is an suggested “option”, as it offers a location to egress the swimming pool at the deep end. NOTE: Regarding the Sunken Fire Pit Lounge Area, The space according to the dimensions exhibited do not provide enough distance for the center piece Fire Pit Concept. Thus…we have placed (2) two Fire Pit / Water Features as an alternative Fire Pit Concept #2 idea. 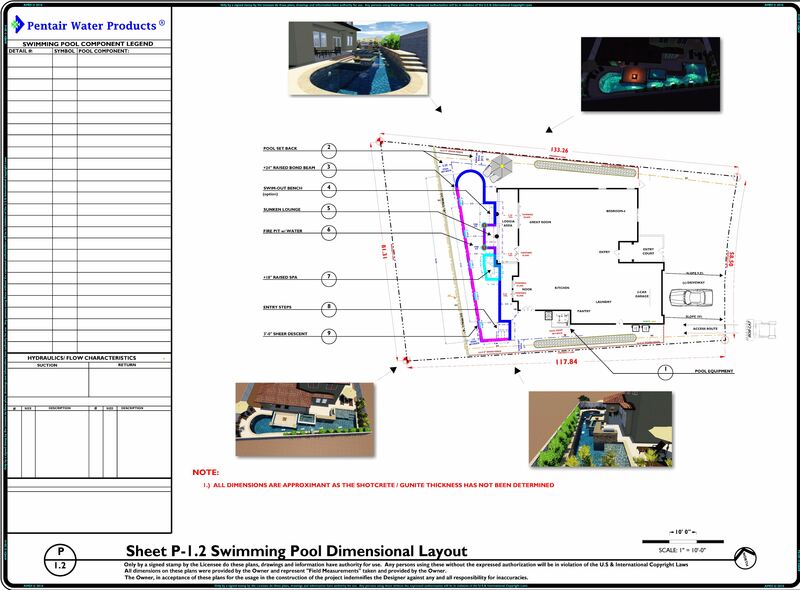 If the pool width is increased by pushing the back pool wall closer to the (e) 6′-8″ retaining wall, then the sunken lounge that was originally imagined, may have room to be reconsidered? 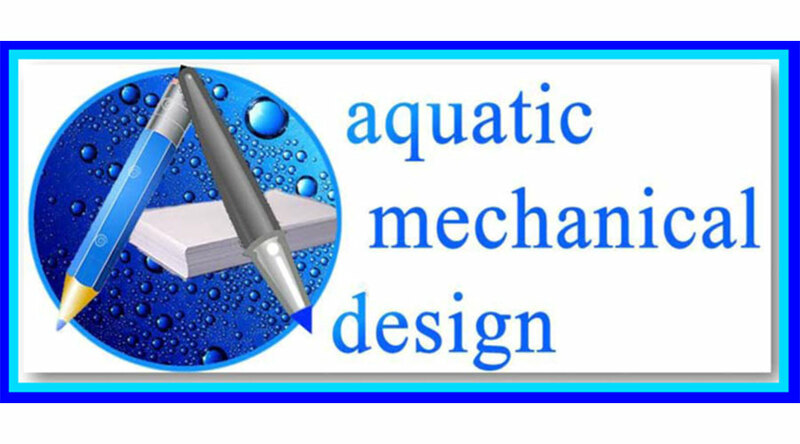 Also…please see P-1.2 REV-2 below with enlarged fonts and plan modifications per your request. The advancing P-SHEETS Will provide the locations of the Pool / Spa layout together with the Lights, Skimmer, Main Drains and other components. Please confirm by use the FORM at the bottom of this page to address your corrections.